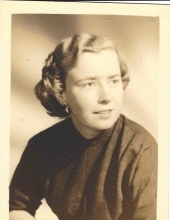 Gloria Strickland Dooley, 87, of Atlanta, passed away peacefully on March 18, 2019 at Emory University Hosptial. She was born September 27, 1931 in Dobbs Ferry, NY. She was preceded in death by her parents, Clifford and Virginia Hutto Strickland, her husband, John (Jack) Allman Dooley Sr and her sister, Dorothy Strickland Stockton. She is survived by her two sons, John Allman Dooley Jr. (Sandy), Ansel Strickland Dooley (Victoria) and grandson, Jay Allman Dooley (Stephanie). She graduated from North Fulton High School. Gloria was a member of Haygood United Methodist Church for 46 years. She was a talented artist; teaching clay, ceramics and sculpture in the Atlanta area. She will be greatly missed for her spiritual, caring nature, her fun sense of humor and her radiant smile. To send flowers or a remembrance gift to the family of Gloria Pegues Dooley, please visit our Tribute Store. 1015 East Rock Springs Road, N.E. Guaranteed delivery before Gloria's church service begins. Please make donations, in Mrs. Gloria Dooley's memory, to the Music Ministry of Haygood Memorial United Methodist Church. "Email Address" would like to share the life celebration of Gloria Pegues Dooley. Click on the "link" to go to share a favorite memory or leave a condolence message for the family.